Big Sur is spectacularly beautiful. If you live in the region, you already know that. Known internationally, it has a number of ‘must see’ landmarks. 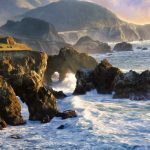 Numerous articles have been written by residents and travelers alike, from all walks of life, about what to do or see while in the Big Sur area. Following is our list of 10 places to go or see, drawing on many of what we feel are some of Big Sur’s most exceptional places. Highway 1 leads to most locations in the Big Sur area. This drive is actually about 85 miles, but you need to be on the alert as you drive, for places to stop and admire the scenery. 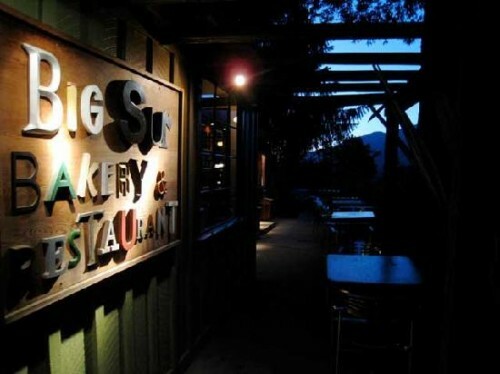 One of the most frequent and delicious stops in Big Sur, for locals and tourists alike, is the Big Sur Bakery. Much more than breads and treats Big Sur Bakery offers breakfast, lunch, dinner, and a respite for the weary traveler. Along with their flourless brownie with walnut ice cream, they recommend slowing down to appreciate all that Big Sur has to offer your senses. 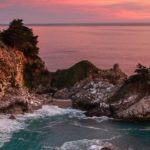 Consistently rated as one of the most popular attractions in the area is McWay Falls. It’s just over 35 miles south of Carmel off Highway 1, located in Julia Pfeiffer Burns State Park. The 80-foot waterfall from McWay Falls flows year ‘round. It’s unusual in that it, along with the Almere Falls, flows directly into the ocean. There’s actually a hiking trail, less than a mile, that leads directly to it. Click here for that information. The park itself is named after a respected pioneer woman from Big Sur country. 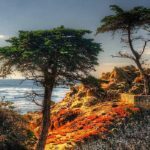 You’ll see redwoods, tan oaks, the waterfall as mentioned, and a fabulous view of the ocean and many miles of rugged coastline. Bookstore, art center, and more; the Henry Miller Memorial Library is well worth visiting. But perhaps not for the reasons you think. 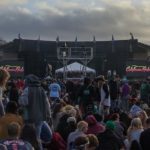 Besides the fame of its name, and the books and objet d’art, it is a well-known and loved concert spot. How so? Outdoors in the towering redwoods, with the ocean a few steps away. As you head out from Monterey, it would be hard to miss Bixby Street Bridge. In fact, it’s one of the most photographed and popular attractions in this area, and has been featured many times in movies and on television. It was completed in 1932. It’s not that it’s long: it’s the architecture – height and arch – and the amazingly dramatic view of the coastline.Why include accommodations and a restaurant? You won’t want to ‘do’ Big Sur in just one day, unless you’re in the area and make a day trip or two. Each of these unique places have a history, and offer something special. Post Ranch Inn is a luxury resort with an unbelievable view of the coastline. Their restaurant Sierra Mar is an exceptional and creative fine dining experience. Big Sur Lodge has cabins in Pfeiffer Big Sur State park. They’re cottage-style, with great decks and amazing views of the surrounding redwoods. Near hiking paths, it offers free access to the state park facilities, and more. Trip Advisor’s rating of the New Camaldoli Hermitage is 4.5/5. This branch of the Benedictine family was founded in the 10th century. It’s located in the Santa Lucia Mountains. While not for everyone, this is the spot you’ll want to go to if you love solitude and an opportunity to quietly experience some of the beauty of the Big Sur area. Treebones Resort is considered a ‘glamping’ site: glamorous camping! You’ll find wood floors, redwood decks, and Adirondack’s that have ocean views. Campsites are also available. Ask about their “nest”! Nepenthe Restaurant, besides offering great California fare, is about the view. With a terrace perched on a cliff over the Big Sur coastline, the vistas are extraordinary. The Esalen Institute is a retreat, spa, and self-help experience rolled into one unique location. You must make reservations as their workshops are the main attraction for a stay at Esalen. Rooms are shared unless there are two of you attending together. 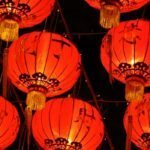 You are able to take advantage of their workshops while staying elsewhere in the area.